Hi everyone! Sally here today. I don't know about you but my family members are huge fans of our local college, Boise State University(BSU). We go to every home game and if they are reasonable close we even travel to a few away games. This particular year we were in the Las Vegas bowl game and my husband took our kids to see it. This is my daughter at the game. All of the orange papers from the September Trio kit worked perfectly for this photo, something that's hard to find and I have tons of photos with the orange and blue. Since the blue wasn't quite the right color I just added a strip of ribbon from my stash and my alphabet stickers in blue. I hope you are having a wonderful week. Be sure and check out the remaining kits in the store. I've really enjoyed this one. Have a happy scrappy week! This weekend started the beginning of my family’s holiday season. For us, that season lasts from the weekend before Halloween until my wedding anniversary in January. During this time, we are more active than the rest of the year. We take more pictures, and that means that I can scrap more. I usually scrap my photos within a week or two of when they were taken, so late summer and early fall are sort of a scrapping dry spell for me. I have to dig through my pictures to find something to scrap during those times instead of having new photos with memories fresh on my mind. You can imagine that I was happy to have some fresh pictures from fun family outings to work with. Today’s layout using the September Main Kit, is a photo of my niece, Brooke. She is the older of a set of twins, and it’s nearly impossible to get a picture of her smiling. She’s in that age when she thinks it’s fun to make weird faces at the camera. So when I caught this picture of her, I decided that it deserved its own page. I got out my mixed media supplies for this layout too. I used a stencil and modeling paste to make the white chevrons pointing at the picture. I wasn’t ready to commit to putting it directly on the patterned paper, so I added the detail to a transparency, that I stapled to the layout, when I decided where it would go. Do you have a lull in your scrapping as the season begins to change from Summer to Autumn? Do you look forward to the massive number of pictures that will be coming to scrap over the next couple of months, or does it give you anxiety? I have to say that I can’t wait. May the scrap be with you! This weekend, I felt like playing with my paper, but I haven't been taking a lot of pictures lately, nor did I feel inspired to make a full scrapbook layout. I turned to my September 3 Scrappy Boys kit. Here are some close ups of the two cards. Do you ever make snarky or sarcastic projects? If not, you should, there's a certain catharsis about it. Have fun with your kits! See you next week, but until then...Snarky Scrapping! Hello All Lanette Here to share a mixed media layout that I created using just a few scraps from Septembers Add-on Kit. Kit Products Used: Pink Paislee Pattern Paper, American Craft Thickers, Doodlebug Stickers, Glitz Stickers and Maya Road Wood Doilies. Just a few details for fun! And for just $29.93 you can start scrapping with this kit! But don't stop there! The store has some amazing deals, HOP on over now and don't miss out! Hi! It's Sally here. Today I thought I'd share this layout I created with the September Trio Kit. This time I chose to play with the MME Jubilee line. Isn't it fun?! I also chose to use the fun kraft doily from the kit, the fun Queen & Co Glitter dots and the "totally" in my title is from the Heidi Swapp Epoxy Stickers. In fact, the only thing I used not in the kit is the background cardstock, navy cardstock and the kraft Thickers, which are from the August 2013 Main Kit. I still totally love the fun mini alphas in the kit. I love all the fun colors to choose from and to be honest, I have a HUGE collection of the mini alphas. Thanks for stopping by today! 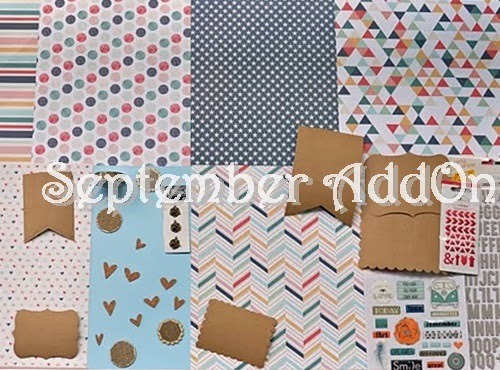 Don't forget to check out this month's kits as well as the other items in the store. There are so fab items still 50% off! Have a happy scrappy day! Were involved in making cards this last week for World Card Making Day? My day was filled with family so I wasn't able to play along on Saturday but I was very inspired by some of the card sketches I found and have chosen to create a few with the September 2014 Trio Kit. One of the things I loved in the kit were these cute pinkish/red polka dot bags by Pebbles. I think they are so cute! Of course, I'm a polka dot fanatic so I knew I wanted to use them somehow. I chose to use it as my patterned paper for this card and add a bit of that darling black/white diagnal striped paper by Shimelle. I also used the fun black and white chalk labels from the kit to add my sentiment on. Kit products used: Pebbles envelope, Melissa Frances chalk label, Black/white diagnal striped paper by AC heart Shimelle. This second card is created using the fun MME Jubilee papers from the kit as well as the orange cardstock. I chose the dotted paper(surprise) and layered it with a bit of black to pull in the black from the chalkboard journaling block. I used the mini alphas by Basic Grey in the kit to create my sentiment and fussy cut a few of the circles to add to the bottom. I added a few buttons from my stash and a bit of twine. I challenge you to pull out your scraps and create a few cards. I love making a few each month to add to my stash. That way I always have the cards that I need. Be sure and check things out in the store. They are still 50% and you can't go wrong with that! Happy Scrapping!! The Add On Kit Rocks! Even though National Card making has passed, I am still making cards :) I saw so many stunning cards popping up everywhere I just had to make one too! So lets take a look my card using Septembers Add-on Kit. A quick coat with a black marker and these thickers really POP! Thanks so much for stopping by today! I would love to see a the cards you all made for National Card Making Day please share theme with us here! Who knows... there could even be a prize! The colors and patterns in this kit are just lovely, and I had a really hard time cutting into them. (They're just so pretty!) Once I started, though, It was super easy for this layout to come together. I made it for my sister, who is having a bit of a hard time right now. This kit is full of all the perfect little details for brightening up anyone's day. I hope you give this kit a try...it's tons of fun! Hi everyone! Sally here. Today I am sharing a completely different style for me. I found this photo and thought it was cute with the pink and mint combo. 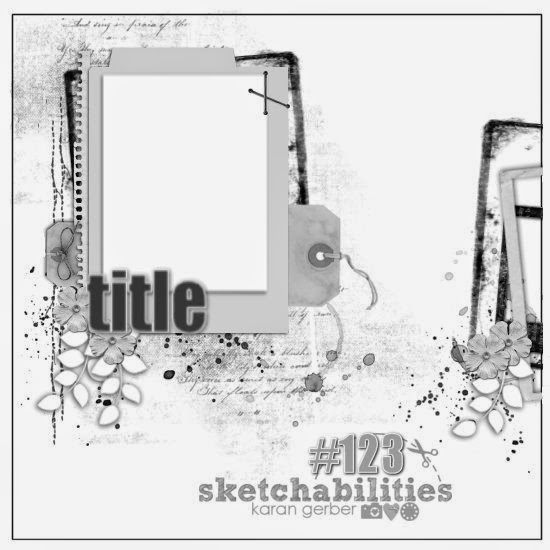 While trying to figure out what I wanted to do with it, I came across a fun sketch by Sketchabilities - a fab sketch site I where I was blessed to be on the DT for a bit. Karan Gerber, the sketch designer, has changed her style up to be a bit more grunge/mixed media style. I decided to give it a try. I can't say I'm thrilled with it(that dang perfectionist in me struggles with the messy style) but will admit it was kind of fun to try something a bit outside my box. I used some texture paste and a fun Prima mask I love (but rarely use). Oh, and then I even used some stamps, yes stamps, on my layout. I do need to apologize a bit for the not so straight photo. With the wetness of the paste on my layout, it made the layout a bit hard to photograph straight. With that said, I pretty much stuck to the items in my September Trio kit minus the texture paste, stamps, the mini black alphas and a few of the flowers. I used the b sides of the Shimelle papers and the mint cardstock is in the kit. I would challenge you to stretch yourself and try a few things you rarely do. It was fun to play and I enjoyed the process. I'd love to see what you create outside your box! Thanks for stopping by! Have a happy scrappy day! !